Confession: up until this point I plowed through 1-2 Judy Blume books a day. Then, I read Smart Women. It took me a week. At first I felt like it was kind of a slog. Familiar territory. Once again, we have adult women. We have a steamy hot tub scene with a naked guy right off the bat. The women-- two main characters, both divorced-- seemed overly muddled and needy to me. I'd rather read Wifey again. But then: enter the teenage girls, the other two narrators of the story. Remember a few posts back when I said I loved the adult stories peeking out of the corners of Blume's children's books? This book mashes together all three of Judy's best demographics: a pre-teen. A full-fledged teenage girl. And two adult women. So Sara knew that the crisis had to do with her father. She called Jennifer for advice, but Jennifer told her to just stay out of it. That parents have to learn to solve their own problems. Sara doesn't get a lot of narration time in this book, but she's the one who illuminates just how unlikeable her mother B.B. is (who has a breakdown and largely ignores her daughter for the duration of the book). I love you, Sara. I'd read more books about you. And Michelle-- you and your first love, too. Just found this opening paragraph from People in 1983. So Judy. So Smart Women. Were the 80's as ridiculous as they seemed? If Judy Blume were the protagonist of a novel, she'd be pretty hard to stomach. 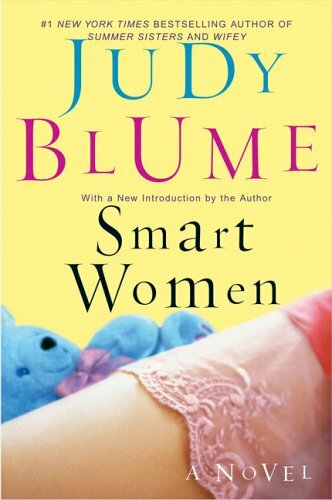 Rich, famous and fresh-faced at 46, she has two stylish abodes, a devoted lover, a pair of grown children who actually like her and a new book, Smart Women (Putnam, $15.95), on the best-seller list. She knows how to tap-dance, get a good table in a crowded restaurant and inspire loyalty among millions of readers. Add to that the fact that she's a genuinely nice person, and Blume's story would seem to have all the dramatic tension of The Joy of Cooking.